This game is about fox adventures and you must collect enough coins to win the level. Drop items to help the fox. 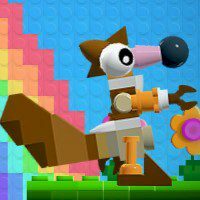 The LEGO fox is moving forward and needs your assistance to finish the level. Can you help it to collect coins and dodge all obstacles and gaps ahead? This is quite simple, but you need to drop the right item at the right time.